Field Marshal Cariappa was commissioned into the army in 1919. This was just after the first world war and he was sent to Mesopotamia (Iraq). During World War II Cariappa served in Iran, Iraq, Syria and Burma (Myanmar). For his service during the Second World War, he was awarded the Order of the British Empire (OBE). He was the first Indian to command a battalion. In 1944 he became the first Indian Brigadier. In 1947, as a Major General, Cariappa was one of two Indian army officers sent to the Imperial Defence College in Camberley, U. K., to receive training. He also helped re-organise the Indian army and worked on the partition of the Army between India and Pakistan that year. 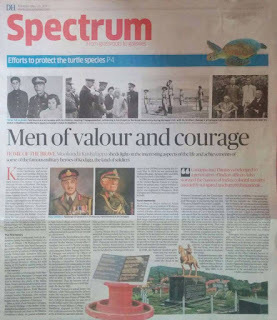 Photos of Cariappa's parents and the statue of the Jawan, on a mantel. Cariappa had begun to urge India to prepare against China. As C-in-C, Cariappa first informed Nehru about a possible threat from China around a decade in advance. But Nehru dismissed the statement harshly, believing that China would indeed defend India's North-East Frontier Agency (NEFA) rather than attack it! Cariappa was religious and a devotee of Sai Baba. While Cariappa was fluent in Kodava, Kannada and English, people used to make fun of his Hindi. According to his son, K. C. Nanda Cariappa in his 2007 book Field Marshal K M Cariappa on his father, “he made gaffes and dropped bricks” when he addressed the troops in the language. But despite that drawback the Field Marshal made an effort to verbally reach out to the families of the Indian soldiers. Cariappa at his regiment's temple, 1960. According to Major General Arjun Muthanna, Cariappa and Thimayya belonged to a generation of Indian officers who set the tone for making the Indian army apolitical and ensured that the army served the nation and not the other way around. Their belief in democracy contrasted the state in Pakistan where military dictatorships became the norm. Cariappa was a pioneer, the earliest among Indians to rise up the British Indian army ranks. It was a time when the British army were leaving India. Hence the early Indian officers had to rise to the challenge and shoulder additional roles in a very short time. Ailing Cariappa taken care of by Havildar Vijayan who was by his side upon his death. G. G. Rajendra Kumar, grandson of freedom fighter Gundugutti Manjunathayya, recalls being accompanied by his grandmother as a kid on a visit to Cariappa’s house. Upon the grandmother’s insistence Cariappa had tea served to her exceptionally in a native lota (small steel cup) instead of the regular European ceramic teacup. Field Marshal Cariappa's statue, Madikeri. Photo by the Author (Mookonda Nitin Kushalappa). From the book 'Field Marshal K M Cariappa' (Niyogi books, 2007) by his son Air Marshal K C Cariappa. 1. Cariappa, fifth from right, back row, 1920, Mesopotamia. 2. Cariappa (in white, in the middle) during his wedding, 1937, Bangalore. 3. Cariappa with his son, in Quetta, 1940. 4. Cariappa seated at the right end, at a Commanders' conference, Delhi, 1948. In 1948 Pakistani raiders invaded Kashmir and war with India was imminent. The then Lt. Gen. Kodandera Madappa Cariappa became head of the Western Command and led Lt. Gen. S. M. Shrinagesh and Maj. Gen. Kodandera Subayya Thimayya. It was during this war that Thimayya helped India secure Ladakh. Without oxygen cylinders, the famed fighter pilot Mehr Singh, who later became Air Commodore, flew Major General Thimayya 23,000 feet above sea level over uncharted mountainous territory. After Thimayya landed safely in Leh, Ladakh, he commanded tanks in the 11,500 feet high Zojila pass and destroyed 25 enemy army bunkers, despite heavy snowfall. This showed that Thimayya was not afraid to take risks and that he was able to lead dangerous operations because of his dynamic personality. Thimayya was commissioned into the army in 1926. During WWII, he successfully commanded active operations in Burma and was awarded the Distinguished Service Order (DSO) for his services. He represented India during the surrender of the Japanese and was awarded the 'Keys to Manila' in the Philippines. Thimayya became the chairman of the Neutral Nations Repatriation Committee after the Korean War (1950-1953). It was a delicate task since he had to manage troops from different nationalities. It was his team's responsibility to ensure that the large number of North Korean and South Korean PoWs were safely sent to their respective homes. For this role Thimayya won accolades internationally. The two generals from Kodagu, Field Marshal K. M. Cariappa and General K. S. Thimayya, eventually rose to become chiefs of the Indian army. Officers such as Cariappa and Thimayya were able to create awe in their seniors as well, which was no easy task. Even Nehru, the first PM of India, who felt this way, had to do something about it. Khushwant Singh, the novelist and journalist, states that during government ceremonies V K K Menon, the then defence minister, would take General Thimayya around in his car. Menon would sit next to the driver and hence make Thimayya to sit in the back seat. Thimayya found this awkward; he was being treated as more important than his boss, the Union minister in-charge of the armed forces. But Thimayya found a way to get out of this. He would take up the driving wheel himself and make the driver sit behind. Then he would chat with Menon as he drove the car. Cariappa had already demanded that India must face China. But Nehru didn't heed. While Thimayya informed the PM and the defence minister about the possibility of war breaking between India and China he was not taken seriously. In 1961 Thimayya retired as the army chief and China had already started attacking India. General Pran Nath Thapar succeeded Thimayya as the Army Chief. China invaded India and then the 1962 Sino-India war broke out. Lt. Gen. Brij Mohan Kaul was put in-charge of the war efforts in the north-east. The war ended with China voluntarily withdrawing its offensive while it was still winning. Gen. Kaul then resigned from his post. Major General Kodandera Arjun Muthanna is related to both Field Marshal Cariappa and General Thimayya. He was commissioned into the 10th Battalion of the Garhwal Rifles Regiment, then served in the 18th Battalion which was posted in Sri Lanka and later commanded the 12th Battalion. He had the following anecdote to narrate. The photographs are from the books 'Field Marshal K M Cariappa' (Niyogi books, 2007) by his son Air Marshal K C 'Nanda' Cariappa, 'Field Marshal Sam Manekshaw', by Brigadier Panthaki and Mrs. Panthaki (Niyogi books, 2014) and the article's author. Captions : 1. A 1962 cartoon in The Pioneer newspaper, Lucknow, showing Cariappa waking up the politicians as China attacks. 2. Cariappa awarding Dhyan Chand a trophy in 1951. 4. General Thimayya's statue in Madikeri. 5. General Thimayya with the then Major General Manekshaw in the Gorkha regiment barracks. The main sources for this essay are newspaper reports and army records found in the public domain. Major Mangerira C. ‘Vinod’ Muthanna was an army officer who guarded India’s frontiers in the Kashmir valley against cross-border terrorists. He was born in 1964 in Chettimani village, near Bhagamandala town, Madikeri taluk in Kodagu. Joining the Officer’s Training Academy in Chennai in 1984, he was commissioned into the army the following year. He first served in Jammu and Kashmir (1985-1991), then in Punjab (1991-1993), next in Arunachal Pradesh (1993-1996), later in Bangalore (1997-1999) and finally again in Jammu and Kashmir (1999-2000). During his 15 years’ tenure he rose from the position of a Second Lieutenant to that of a Major. He was part of the 5th Sikh Light Infantry unit, Rashtriya Rifles. In the year 2000, Major Muthanna was posted at Khanabal in Anantnag district, Jammu and Kashmir. This remote army base was however near Srinagar and along the main National Highway of Kashmir. Under constant attack from terrorists, it was the army’s responsibility to guard the civilians and the infrastructure around the camp. On an eventful day, the 12th of January that year, four Lashkar-e-Toiba militants arrived in a Maruthi Omni van, at around 6 in the evening. Armed with AK47s, grenades and rocket launchers, they forced themselves into the barracks and began to fire indiscriminately. But the Jawans returned fire and stopped the moving vehicle. One militant was promptly shot dead and another was wounded by the soldiers. However, the remaining two escaped unseen into a small, two-storey building nearby. Major Muthanna informed his Commanding Officer about the situation. The attack had stopped for a while but the militants’ location within the camp was unknown. Upon the CO’s instructions the Major had the area sealed and searched. The militants were discovered in that building, which was across the road. It had only one entry-point and a stairway. Two jawans then entered the building in order to capture the militants. But they were shot at and cornered. At that moment Major Muthanna decided to risk his life in order to save his men. He quickly entered the building after them. While he provided cover to the two injured jawans, they were taken away to safety. In the meantime he managed to shoot dead one of the two militants. But in the process he was fatally wounded himself. He sustained a bullet wound on his right side below the hips. A grenade hurled at him had exploded in his face, again on the right, and badly injured him. Seven hours had flown by since the militants’ arrival. The time was 1.30 in the midnight. The Major had lost consciousness by then. The two Jawans who were undergoing treatment had informed the others that Major Muthanna was fine when they parted. The Army had fired upon the building in order to save the Major trapped within. The remaining militant pretended to surrender and was to be taken away. Before he was to be disarmed an interrogation took place. It was then that he began to fire again at the soldiers from inside the building. The soldiers shot back at him. He was killed but not before he removed the pin of a grenade and held on to it while dying. His intention was to blow up anybody who would lift his corpse. The building was taken by the army at 3.30, in the wee hours of the morning. Meanwhile the Major, aged 36, succumbed to his injuries. His corpse was found inside the structure. The alert soldiers became aware of the unexploded grenade. They were able to prevent any further damage to themselves from the probable explosion. The terrorist’s final plan was hence thwarted. Lives of civilians and soldiers were saved by Major Muthanna’s courageous deed. He was awarded the Shaurya Chakra posthumously. This military decoration, an equivalent of the Vir Chakra, was for his bravery and self-sacrifice, beyond the call of duty, during an enemy attack in times of peace. Major M. C. Muthanna Marg (road), Major M. C. Muthanna Army Goodwill High School / Public School and a recreation hall named after him, all three in Khanabal in Jammu and Kashmir, were inaugurated by the Indian Army. Manjunath Acharya of Somwarpet made the sculpture of him which was unveiled near the Town Hall at Madikeri in 2010. Kodagu is not just known for its serene landscape and picturesque surroundings, but also for the valour of its people. Rightly, the district boasts of several military heroes. The statues of such brave men can be seen in Madikeri. The Sudarshan Circle in Madikeri is flanked by the statue of Field Marshal K M Cariappa and the equestrian statue of Subedar Guddemane Appayya Gowda. One of the earliest revolutionaries from Kodagu, Appayya Gowda, was hanged by the British in 1837. His contemporary revolutionaries from Kodagu included Subedar Naalnaad Mandira Uthayya, Chetty Kudiya and Shanthalli Mallayya who were imprisoned for many years by the British. Further along the main road, you can see a circle with the statue of General K S Thimayya. If you take the deviation to the right, you will find Major M C Muthanna Circle near the town hall and Squadron Leader A B Devaiah Circle near the private bus stand. In Kunda, near Gonikoppal, lived the Kodandera family, hereditary chieftains of a group of villages. I M Muthanna’s Coorg Memoirs mentions that Naad Parupatyagar (native village official) Kodandera Kuttayya was the grandson of Diwan Mandepanda Thimmaiah. Between 1901 and 1909, he was the assistant commissioner and highest ranked native official in the then Coorg province. When his wife Dechy, or Dechamma, passed away, a locality in Madikeri was named as Dechur in her memory. Two members of this family, Field Marshal Kodandera Madappa Cariappa and General Kodandera Subayya Thimayya, rose to become the chiefs of the Indian Army. Hence, the Kodandera family came to be considered as the first family of Kodagu’s military heroes. Field Marshal Cariappa was the son of Kuttayya’s younger brother Madappa, who worked in the revenue department. General Thimayya was the grandson of Kuttayya. Born in 1899, Field Marshal Cariappa, 'the Grand Old Man of the Indian Army’, studied in the Madikeri Government Central High School and then in the Madras Presidency College. He gained admission at Daly Cadet College, Indore, in 1919 and was commissioned as a second lieutenant in Bombay’s 88th Carnatic Infantry, during World War I. The following year, he served in Mesopotamia (Iraq) and was promoted as a lieutenant. He became the first Indian army officer to attend the Staff College in Quetta. He married Muthu Machia, a forest officer’s daughter, had a son K C Nanda Cariappa, who later rose to the rank of air marshal, and a daughter, Nalini. During World War II, Cariappa was awarded the Officer of the Most Excellent Order of the British Empire (OBE). He became the first Indian to become a brigadier. Cariappa also served as India’s first commander-in-chief (C-in-C) between 1949 and 1953. Now this position rests with the President of India. He represented India as its high commissioner in Australia and New Zealand from 1953 to 1956. In 1986, he was made a field marshal. Thus, he became one of the two Indian army officers to hold this rank. He died in 1993. General Thimayya’s actual name was Subayya, while Thimayya was his father’s name. He was born in Madikeri in 1906. Admitted to the then Prince of Wales Military College in Dehradun, he was one of the six Indian cadets who underwent training in Royal Military College, Sandhurst, England. In 1926, he was commissioned into the Indian army. In 1935, he married Codanda Nina and the couple went to Quetta. During the Quetta earthquake that year the couple rendered outstanding humanitarian service. During World War II, Thimayya was awarded Distinguished Service Order (DSO). He represented India during the Japanese surrender. Between 1953 and 1955, Thimayya was the chairman of the Neutral Nations Repatriation Commission. He gained international fame for the way he handled the exchange of the prisoners of war (POWs) held during the Korean War. In 1954, he was awarded the Padma Bhushan. Between 1957 and 1961, he was the chief of the Indian army. In 1964, he was appointed Commander of the United Nations Forces in Cyprus, where he passed away. Cyprus released a stamp in his memory, and later, his wax statue was displayed in Singapore. Both Cariappa and Thimayya are iconic figures in India. According to Major General Arjun Muthanna, a great grandson of Kuttayya, Cariappa and Thimayya belonged to a generation of Indian officers who stormed the bastion of India’s colonial masters and deftly navigated unchartered situations. Both had huge responsibilities thrust upon them at a relatively young age and rose to the challenge. Cariappa, commissioned as a lieutenant when Indians were just being permitted to become British Indian Army officers, would 'Outbritish the British’, probably to be accepted and treated as an equal by the British officers. A strict disciplinarian, he demanded punctuality and proper dress code. He was fiercely nationalistic and moulded the Indian Army into its current apolitical position. In 1948, the Kashmir situation grew tense and war was imminent. Lieutenant General Cariappa became the head of the Western Command and led Lieutenant General S M Shrinagesh and Major General Thimayya. It was during this war that Thimayya helped India secure Ladakh. Cariappa’s contemporary and friend, Lieutenant General Nathu Singh, was first offered the post of C-in-C but he declined and stated that his senior Cariappa, who won the 1948 war for India, was more eligible for the post. It was on January 15, 1949 that the three centuries old colonial army became a national army. That was the first time an Indian, General Cariappa, was made chief of the Indian armed forces. Every morning, Cariappa paid his respects to the portrait of his parents and the statue of a jawan. He was ever thankful to the soldiers for protecting the country. Hence, he was called the soldiers’ general. Cariappa would go to the war front, even after retirement, in order to motivate the troops. Thimayya was charismatic, approachable and had great interpersonal skills. When Thimayya visited his Dehradun alma mater as an alumni, one of the cadets there wanted to know how to address the general. Thimayya simply replied 'Call me Timmy’, referring to his nickname! Some of the other military heroes of Kodagu are: Major Mangerira Chinnappa Muthanna, who was awarded the Shaurya Chakra posthumously, and Squadron Leader Ajjamada Bopayya Devaiah, nicknamed 'Wings of Fire’, the only Air Force personnel to be awarded the Maha Vir Chakra posthumously so far.